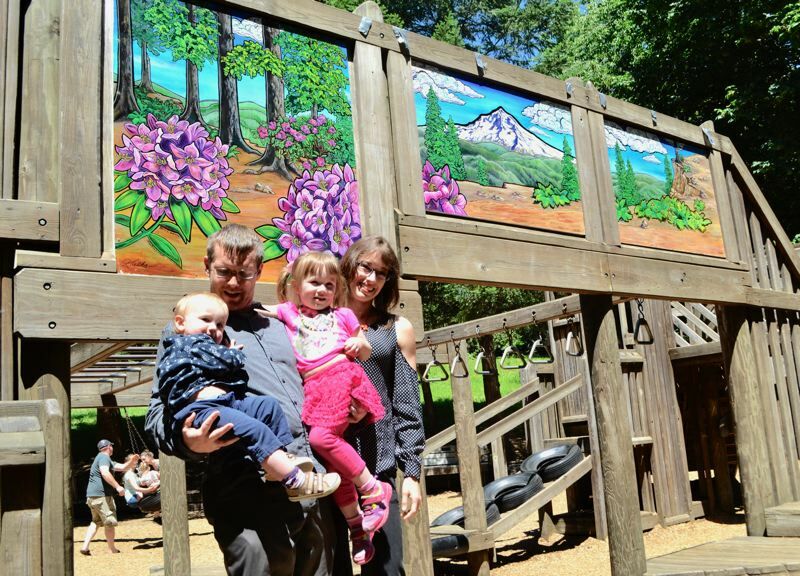 The Fantasy Forest play structure in Meinig Memorial Park gained a new pop of color on Friday, June 29. In March, local painter Karin Hoffman approached Economic Development Manager Dave Snider with an idea for a triptych mural. She was at Meinig Memorial Park with her children one day and noticed three empty spots on the side of the play structure. "I happened to notice (these open spots) and thought a mountain scene would look good there," Hoffman told The Post in a previous interview. "I thought it would be a way to help the city of Sandy." Hoffman has lived in Sandy since she was 14 and is now raising her two young children there. "I'd like (the mural) to just be a representation of Sandy and give people a bright outlook when they see it," Hoffman noted. Mayor Bill King accompanied Snider and Hoffman in hosting a ribbon cutting for the occasion on Friday. "I had three little boys — they practically grew up here when this place was brand new," King told the assembled crowd of parents, supporters and city staff. "They absolutely loved (Fantasy Forest), so we've crawled through the entire thing. I love the fact that we're going to bring more color and more life to it." King added that the timing is especially fortunate because the city is planning to have the people who designed the park come out do a condition evaluation soon and recommend possible upgrades and repairs to spruce up the structure in its entirety. "It's getting a little aged, because my 'little kids' are now in their mid-20s," he added. "I'm really pleased that we're bringing some color and that what you've done, Karin, is a prime example of how to be proactive in your community. I really appreciate you coming to the city with an idea, and you have the skills and ability to contribute to something that is loved by so many kids."